I subscribe to the Moleskine newsletter and I thought the new Notebook Toolbelt was a neat addition for them. At $55 US I don’t know how popular it will be but it looks cool. 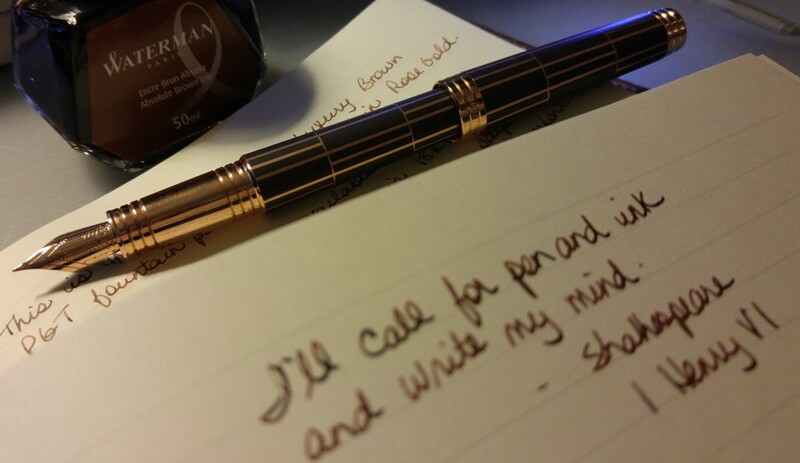 I just love the pictures of notes in this article on the Pen Heaven blog. Good ideas on how to improve your notes and have fun at the same time. When I go to a talk or conference I do try to summarize but I am one of those who try to get every word down. So something I have to work on. And finally Madigan at Goulet Pens wrote this excellent article, 7 Reasons to Gift a Fountain Pen. You could just print this off and leave it in a conspicuous place so Santa Claus can’t miss it! Enjoy. So I was in NYC over Thanksgiving and went to the Moleskine store-my first time ever. Pretty frustrating as a lot of stuff does not have prices on it. Every once in a while I could find a price but mostly not, so I had to keep asking one of the 2 very young men working there-both of whom seemed annoyed by the question. AND, they didn’t even know-they had to scan the item to find out. They were so snooty-I love Moleskine and have used them for a very long time but that was enough to make me not want to buy their products. But, we went way out of our way to go there so I did buy some small things-one of which was the Tool belt thing you mention although I got the small one for my smaller Moleskine. Interesting that the larger one is $55 as I had no idea from looking at it since no price on it of course. It is definitely not worth that much-that is crazy. I like the little one as I keep my little notebook in my purse with a tiny pen. But I have purchased other brands of the same type thing to put on my notebook and they were much cheaper. Yes Missy I have a Dollar Store special pencil case with a large elastic that essentially does the same thing. That’s too bad that you received sub-par service at the Moleskine store in New York. Bad customer service can really leave a negative impression of the brand. Hopefully your next trip to a Moleskine store will be much better! I hope so too-certainly won’t go out of my way to get there next time though.